OLD ALBUM, finally released, free, ofc, Surprise!! Dudesses, we got another one. This ones been long in the making but very well worth the long wait (in our humble opinion). Album is called „711“ and you might be able to guess WHEN exactly these fine songs were recorded. Thanks for Everyone involved especially MotorMazze who kept his sanity while Bender and me were backseat mixing :). Next step will be recording some special remniscal songs in the coming months and we hope you´ll enjoy our new old songs until then! Veröffentlicht unter Allgemein	| Kommentare deaktiviert für OLD ALBUM, finally released, free, ofc, Surprise!! Veröffentlicht unter Allgemein	| Kommentare deaktiviert für NEW ALBUM, free for all, of course. 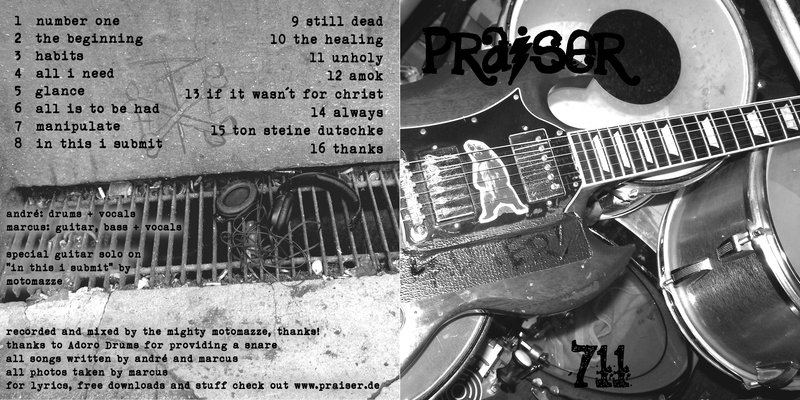 so, check this out: http://praiser.bandcamp.com/ . And you better! Since it took me like 2 hours to set it up. Upvote, people and let the Praise be heard :).